Being both (a) in Chicago and (b) a blogger, I jumped at the chance, and I am so excited to report that I have been selected to take part in this challenge! Essentially, I will be switching to a plant-based diet for 28 days. I am being compensated for this: in addition to a Whole Foods gift card to offset some of the expenses, I will also be receiving tickets to a premiere of a movie about plant-based eating, a copy of a book on the subject (and one to give away on my blog! ), cooking classes, and more. In exchange, I am committing to eating this way for the full four weeks and writing a minimum of two blog posts about the challenge. Whole Foods Market will be offering Healthy Eating 3-day intensive workshops in Chicago beginning in June; they will not only give people tours of the store and samples of products, but also, the link to my blog "so that they can be inspired and gain insight on [my] personal experience." How exciting is this?! I'm really looking forward to this - besides working on two of my 101-in-1001 goals (#10 [going vegetarian for four non-consecutive weeks] and #11 [going vegan for one week]), I'm excited about trying something a little different with my eating - hopefully mixing it up will give me the push I was hoping for with going scale-free. I'm also thrilled about expanding my recipe horizons - I'll be sharing my regular recipe updates on Sundays, but I will also be writing challenge-specific updates on Tuesdays (since the challenge will start next Tuesday, May 10) with the label "WFM" for easy access. I have a lot of research to do. Right now, most of my protein comes from chicken/fish and the occasional post-run protein bar - though I love tofu and often use it in my bucket salads. But Lady cannot live on salad alone! Worth noting, the 10k race I am training for will fall within the 28 days of the challenge - so I need to make sure I am fully nourishing my body pre-, during, and post-race, even without meat. It isn't impossible, it's just not what I am used to. And I'm up for the challenge! What about you? Are you now or have you ever been vegetarian/vegan? What are your go-to resources for meat-free recipes? What are some things you are interested in reading/learning about with regards to a plant-based diet? My husband is vegetarian so that's what we eat at home. I received La Dolce Vegan by Sarah Kramer as a wedding gift. I love that cookbook! Usually, I go to the internet for vegetarian recipes. If you'd like, I can email you some of our favorite recipes! Just let me know! so jealous. 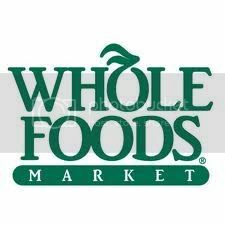 was bemoaning the absence of whole foods market here in UK just this morning. and yeah, figure out that protein!! i've gone back to eating some meat, but on the whole i find i prefer vegetarian stuff now....but am still tracking protein intake until i get the hang of it. I'm a meat eater with no interest in changing that, but I also eat plenty of fruits and veggies, so I'm really looking forward to reading about this! What a great idea from WF. Good luck on your new challenge! That's so cool!! Have fun! Congratulations!!! Sounds like a great challenge! sounds wonderful and good luck with the swith, looking forward to the results! That is super exciting! Can't wait to read about it as I've been considering a change myself. That's awesome that you were selected! Congratulations and good luck! I was a vegetarian for over 5 years, and during that time was vegan for about 4 months (my roommate for the semester was vegan, so it was easy to eat vegan while living with her). My go-to meals when I was vegetarian were veggie sandwiches (full of tons of veggies and a slice of cheese), tofu stirfry, my super-chunky veggie tomato sauce over pasta, veggie burgers, and soups and salads. I also had tons of vegetarian cookbooks that I just recently got rid of (hubby is NOT a vegetarian, so I figured I will probably never cook out of them again - time to let go :( . Have fun with it and experiment lots! This is great. I am so happy for you. You will be able to educate all of us about this eating plan and recommend foods for us to try. Can't wait!! I know there are different vegan eating plans - there are differences concerning dairy, eggs, fish, etc. I can take or leave meat. I don't have to have it at a meal but every now and then it sounds good. omg that is so cool! I'm so jealous, I would love to do something like this!! I was Vegan once for many years. And Vegetarian for many more. Then one day - I stopped. Just like that. Got tired of PETA ads! Feel free to check it out if you've got a few spare mins.